SGL type | Products Lineup | Products | NIPPON BEARING CO., LTD. The NB SLIDE GUIDE SGL type is a linear motion bearing utilizing the rotational motion of ball elements along four rows of raceway grooves. It can be used in various applications due to its compactness and high load capacity. 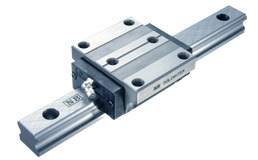 The NB SLIDE GUIDE SGL type consists of a rail with 4 rows of precisely machined raceway grooves and a block assembly. The block assembly consists of the main body, ball elements, retainers, and return caps. The use of relatively large ball elements and raceway grooves machined to a radius close to that of the ball elements increases the contact area resulting in a high load capacity and a long travel life. Side-seals are provided as a standard. To improve the dust prevention characteristics, under-seals, double-seals, scrapers, bellows and special rail mounting caps are also available. Because a 4-row/2-point contact design is used, low friction and stable motion characteristics are achieved even under a preloaded conditions. A lubricant-containing Fiber Sheet incorporated in the block supplies appropriate amount of lubricant to the raceway grooves at appropriate intervals, which can significantly extend the lubricant replenishment interval. The ball elements are positioned at 45° contact angle so that the load capacity is equal in four directions (above, below, right and left). Because the ball elements are positioned to increase their self-aligning characteristics, the dimensional error caused during installation is absorbed. The rail and block assembly can be treated with low temperature black chrome treatment to increase the corrosion resistance. This treatment is standardized with the symbol "LB". Stainless steel SGLS type is suitable for use in clean room application. NB Reverse-seal realizes maintenance free by reducing grease leakage and loss. Nine SGL block types are available depending on the material and mounting method.